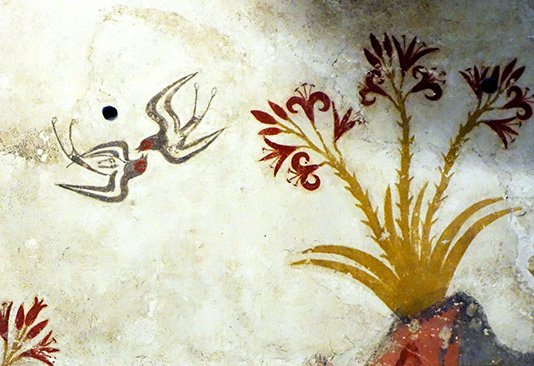 Krinaki , the Lily of the Sea or more accurately Lilly of the Sand, one of the most beautiful wildflowers of our country, was found depicted on a wall painting done 3.500 years ago at Akrotiri excavations in Santorini. Its blossoms still decorate the sandy beaches of our island, spreading their delicate and exotic odors on summer nights. However, despite its endurance and its ability to quickly multiply, due to the constant destruction of the environment and the exploitation of beaches by man, Krinaki is considered today an endangered species. 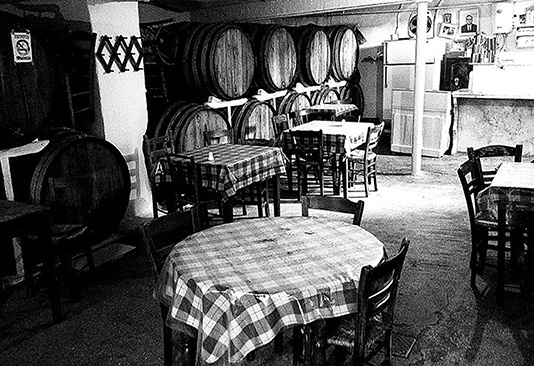 Taverns are a kind of informal restaurants with friendly and cozy atmosphere in which the Greeks accustom to spend hours and hours, drinking and eating, talking, singing and occasionally dancing. The food is always simple, but in the good ones very tasty and with first class ingredients. Their history goes back, 2500 years ago, starting with the ancient Greek “Kapileion”, passing through the Byzantine “Magireion” , the Ottoman “Lokanda” and the Minor Asia “Steki” in which the Rebetiko song was created, reaching our times as “Tavern”. Unfortunately in the recent decades, the advance of new gastronomical morals and traditions have made the good old Greek Tavern look like another endangered species. So, Krinaki, a traditional Greek tavern, two endangered species, on the face of modern times.